For my 40th birthday, I was surprised by my friend Scott Kelly with Black Dog Promotions with a week stay at Salmon Catcher Lodge in Kenai, Alaska. I promptly pulled up Google Maps to find out where Kenai was. I knew I was headed to Seward, and was excited to see that it was just two hours away. I had heard that you had to take boats everywhere in Alaska and I wondered if there was a road between Seward and Kenai. Yes, my friends, just a few short months ago I too, had NO idea how to navigate Alaska! BTW… there is indeed a road! After spending my first week in Alaska hanging with my friends at Exit Glacier Guides, I made the drive over to the Soldotna-Kenai area. This drive is beautiful! Ice blue lakes and huge rivers could be seen from the road. I didn’t realize I was looking at the famous Russian and Kenai Rivers were salmon fishing runs the world up here. People come from all over the world during the summer to fish for salmon in Kenai. It was late in the day when I pulled up to Salmon Catcher Lodge and I was taken away by the sheer beauty and size of the property. There were 2- and 3-story cabins nestled among big beautiful evergreen trees and flowers peeking out everywhere. The main lodge was called the Conference Center. I loved how the Bear Family welcomed me right in! The inside looked like no expense was spared in making this one amazing haven. The kitchen was massive and served breakfasts every morning for the guests. There was a bar area with all sorts of glasses and goblets just ready for some good craft beer to be poured after a day of fishing. What I loved the most though was the massage chair – I knew I would spend a lot of time in that! There were three large rooms with each having 2-4 beds and a private bath. Somehow I ended up being the only one there that week since it was before the season really took off! One morning while I was working away on the kitchen table, I saw this big ol moose wander right on by. You know that made me happy! Salmon Catcher Lodge is truly a Fisherman’s Heaven. Their cabins are built to be able to hold the whole fishing party and then some. Each cabin has a full kitchen, living room, and a ton of space. But what makes this lodge stand out for me was that their was a separate building where you could process your fish and then store it until you went home. Anything that you could possibly need for your fishing trip, Salmon Catcher has you covered. They can even help you plan your trip and get you out on the river with an experienced guide. The owner of the Lodge, Terry Johnson, is a retired airline pilot who decided to make Alaska his home. He not only built Salmon Catcher Lodge but also Salmon Catcher B&B. The attention to detail in both properties simply amazed me! The B&B is what I would pick for a romantic getaway to Kenai-Soldotna. One of the rooms has this large sunken Jacuzzi-tub that I just wanted to soak in. Of course, I noticed the beautiful kitchen which was set out with snacks and drinks. The decorations within both properties were custom pieces with some amazing stained art and metal pieces plus some very beautiful paintings. I loved it there! I can’t wait to go back and spend some time relaxing in this cozy B&B. 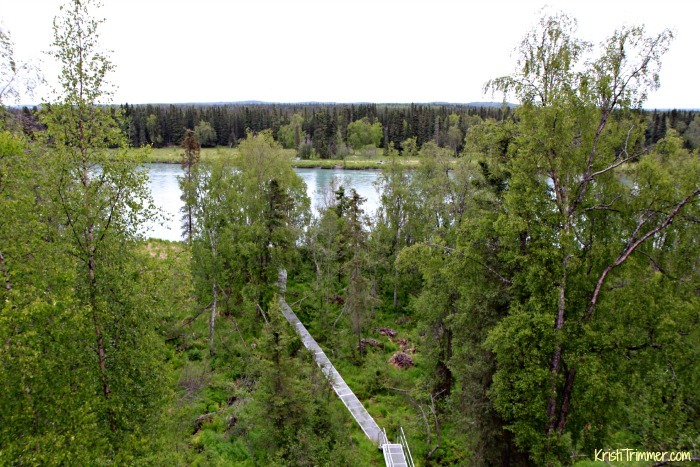 The view out to the Kenai River from the deck is second to none. Take the little pathway out to the banks and fish to your heart’s content. Or sit and read a book – both make me happy. Thank you Terry for welcoming into your Lodge. It was one of the highlights of my summer in Alaska!! I can’t say enough good things about the Lodge and is the number one place I recommend to stay at when coming up to the Kenai Peninsula in Alaska. Yep, I thought it was that awesome! PS… just outside the entrance to the Lodge is where I saw my first Moose and baby!! Disclosure: My stay at Salmon Catcher Lodge was a birthday present to me. I was not under any obligation to write a review nor to fall in love with the property like I did. That just happened. And yes, I really hope I get to go back and spend more time out at the Lodge just steps away from peace and quiet and all those cute mooses! Links within this post may contain affiliate links that I earn commissions from. Example, if you click on the above link and purchase anything from that site I make a small commission, no matter what you purchase. This is how I pay for my travels and this blog. Thank you for supporting me! « Review: Madison Reed. I Hate Grey Hair. I have always wanted to visit Alaska but have always considered a cruise. This would be a lovely experience! Wow – that’s like my dream house…love it!! Looks like a beautiful place to visit! I’ve never been fishing nor to Alaska, but what really appeals to me is the fish shack. Nobody wants to have cabin that smells like salmon- fresh or otherwise!